Fun Fact! 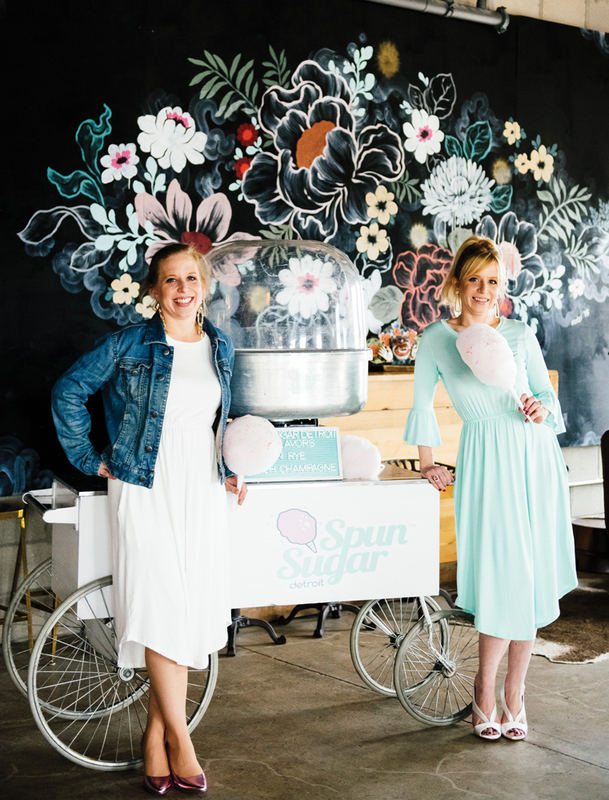 Spun Sugar Detroit Co-Owners Megan Young and Mandy Tamborini are Identical Twins. The first week of May, gray clouds LOOM and spring showers are in the air. 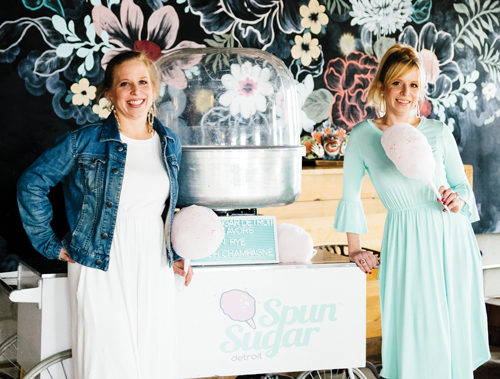 Co-owner of Spun Sugar Detroit, Mandy Tamborini, is talking about a summer staple: cotton candy. Bleach-blonde hair grazes her shoulders and pale pink lipstick frames a cheerful smile as she arranges containers crammed with fluffy, pastel-colored confections. “Being in the advertising industry … everything is your brand. People are going to your website; they’re searching for you on social media. They want to find you.” Within six months, clients found Tamborini, booking the cotton candy cart for private events hosted by the Ford family and the Museum of Contemporary Art Detroit, where she encountered Instagram influencers like Kate Lazarski and Marina Pia Goldi. “Instagram is my jam,” Tamborini says, adding that today, nearly all of Spun Sugar Detroit’s business is driven by social media (@spunsugar.detroit). To create a grown-up version of their childhood favorite, Tamborini and Young confer on unexpected flavor profiles. A departure from the standard amusement park varieties, Spun Sugar’s menu has spiked versions like Strawberry and Blueberry Champagne, as well as sophisticated selections like Honey Lavender and Ginger Peach. I sample the Mango Chili — hell, I devour the Mango Chili, the sweet spice inducing a light sweat. Pastel Palate: Spun Sugar’s color schemes look familiar, but come in grown-up Flavors such as blueberry champagne, Rock n Rye, Mango Chili, and Cake. Perhaps I allowed myself to consume an entire container of cotton candy for its seemingly healthy implications. Tamborini and Young are trying to source organic, plant-based dyes from California as well as ingredients like organic honey from Detroit-based Bees in the D. “It’s cotton candy so I recognize that it’s still sugar,” Tamborini says as a disclaimer. 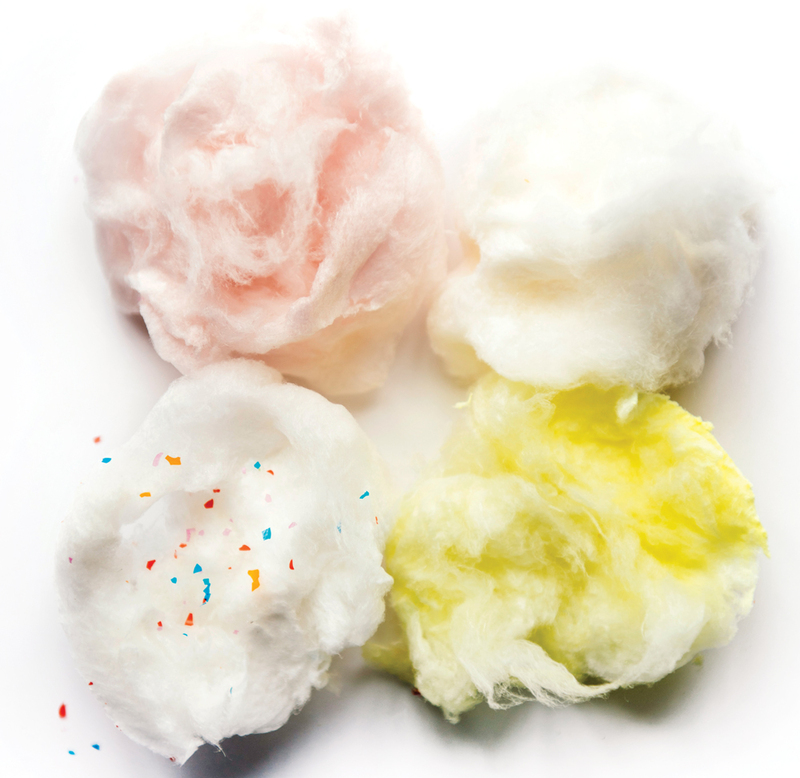 “I just think that the plant-based ingredients make it a cleaner product than traditional cotton candy, which has artificial dyes.” Tamborini says the organic formula is lighter and not as sticky as cotton candy made with artificial dyes. To my untrained taste buds, they’re equally tasty. Today, Spun Sugar Detroit is made in a candy land of a space known as the Proud Mitten Shared Kitchen. The Plymouth-based commercial kitchen is home to local bakeries, cookie shops, and pastry chefs including Darla & Francine’s Cookie Table, Peach & Honey, Two Dolls Bakery, and more. “It’s very fun collaborating around town,” Tamborini says, mentioning that after our meeting, she’d be dropping off a batch of rainbow cotton candy at the new Erskine Street bakery, For the Love of Sugar. She also shared that her confections would be featured in local burger joint Famous Hamburgers’ best-selling milkshake for the second summer in a row, as well as in promotional imagery for an upcoming cotton candy-flavored beverage for New Order Coffee Roasters — the very café that we were seated in. Visit spunsugardetroit.com for more information.